As a service to our clients and readers, we’ve compiled a list of the best biker bars and motorcycle-friendly bars in Los Angeles. We may be motorcycle accident lawyers – but we’re bikers, first and foremost. 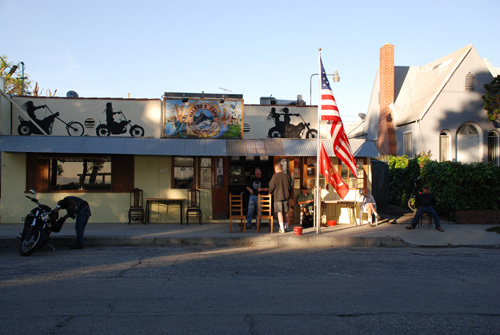 And there’s nothing better than a great watering hole after a long ride – whether it’s along the ocean on PCH, in Angeles National Forest, or in the city. We’ve been to a lot of great gin mills in the LA area, but we can’t see ’em all, so if you have a favorite bar you’d like to see on our list, give us a call or send us an email. Have fun, but please be sure to drink responsibly and never ride while intoxicated. Nice ride in the canyon, Good BBQ on Sat-Sun 11am-5pm. Great Steak dinners starting at 5pm. Great burgers. On weekends, this joint is filled with bikers. Most Sundays, you’ll find an impressive array of motorcycles in the front of the Lodge and filling the adjacent parking lot. We hope you find the above information helpful. Have fun, but please be safe, and never drink and ride. We may be motorcycle accident attorneys, but we are motorcyclists first. We never want to see any of our brothers and sisters go down. We sincerely hope you never need us, but our lawyers are here for you if you do. If you or a loved one has been injured in a motorcycle accident in Los Angeles, please call our hotline or email us for a free case evaluation.